Hello fellow Angelman Community, as this is my first “official” blog I am going to take a moment and introduce myself. I am a research scientist with a specific focus on genetic and neurological disorders. As a doctoral student I did my research in Dr. David Segal’s lab, investigating the therapeutic potential of Zinc Finger-based Artificial Transcription Factors as a treatment for Angelman Syndrome. I am currently doing a postdoctoral fellowship in Dr. Lisa Ellerby’s lab on Huntington’s disease. I hope to eventually have my own research lab focused on neurological disorders as a professor at a university. It is my privilege to share with you all the latest advances in the Angelman Syndrome Community. This past December I attended the annual FAST Scientific Summit where exciting progress toward a cure was discussed. This year was the 10th anniversary of FAST, and hearing the current status of the research gave a perspective on how far FAST has come toward finding a cure. Ten years ago the word “cure” wasn’t even being used, but at this meeting we introduced the community to Dr. Lauren Black, who has been brought on to help with drug development and clinical trials. This blog and the next one are going to highlight the amazing progress being made on some of the FAST funded projects and some brand new projects that will be funded in the next year! The Scientific Summit opened with Dr. Timothy Yu, who is new to the AS community, discussing his groundbreaking work on Battens Disease . Batten’s Disease is a devastating, progressive and terminal disease where juvenile patients die before reaching adulthood. Dr. Yu detailed his lab’s remarkable journey, where he and his team created a personalized cure for a young patient named Mila, in just over a years’ time! Mila had a very rare form of Batten’s, which could potentially be treated by a small RNA silencing drug; this drug would allow for the error in the CLN7 gene to be “skipped” and a correct version to be made in her cells. Mila’s condition was rapidly declining when the team was given the conditional approval from the FDA to start treatment. The drug Milasan was specifically made and approved for Mila’s rare form of Batten’s, and after administration her condition stabilized. Mila’s rapid decline has been halted and she has started to regain some previously lost skills, including the ability to walk and sit upright. What is remarkable about this story is how rapidly a treatment can be approved and how so many of the treatments being developed for AS are using a similar technology. The passion, drive and amazing science that Mila’s story had are all integral parts of FAST, and Mila’s story showed that there is not only hope, but also the ability to realize that hope for every child. One of the key factors that moved Mila’s cure forward was the ability to test the drug in relevant models, both for toxicity and effectiveness. Dr. Weeber, Dr. Silverman, and Dr. Anne Anderson discussed the new AS rat model that was created and characterized by the FAST FIRE team. The rat is called the LEGEND-Rat (Large Deletion Ube3a Rat), and has recently undergone a full collection of behavioral tests to better understand how well this rat reflects the characteristics we see in AS patients. Having the rat model is important as the large deletion reflects the majority of the mutations seen in AS patients, the rat model also allows for complex behavioral tests, which can help identify promising therapies. Dr. Weeber discussed that inside the brain the neurons of the AS rats communicate differently to each other, compared to their neuro-typical litter-mates. This impaired form of communication between AS rat neurons could be compared to that classical cell phone commercial where the individual walks around asking “can you hear me now.” Having the AS rat neurons exhibit impaired communication is important as this neuronal communication is impaired in human AS patients. Dr. Weeber further detailed the altered gait of the AS rat, mirroring the altered gait in human AS patients. Dr. Silverman shared an exciting new test for AS rats that involved choosing a correct image in order to receive a treat. This type of test involves complex learning and memory and the AS rats performed poorly when compared to their neuro-typical litter-mates. Dr. Anderson shared her studies on EEG (electroencephalogram) and seizure activity. A large portion of AS patients experience seizures and have abnormal EEGs, the rat AS model showed an altered EEG pattern and exhibited seizures. This thorough characterization of the AS LEGEND-Rat is important for having an accurate model, testing potential therapies and developing biomarker tests that could be used in human clinical trials to evaluate if a therapy or intervention is effective. For the first time, we heard from two of our newest FAST family members, Dr. Joseph Anderson and Dr. Christina Alberini, on their fantastic FAST funded research. Dr. Anderson’s approach uses stem cells derived from blood cells to make and secrete UBE3A. The general concept involves using stem cells to make UBE3A and then secrete it into the blood stream, which the neuronal cells, which lack UBE3A, absorb the secreted UBE3A. Dr. Anderson showed promising data indicating that the stem cells are making and secreting a functional UBE3A. In addition, he explained that they have developed an AS mouse model that can accept the UBE3A modified human stem cells for further testing of this proposed therapy. Excitingly, these AS mice that can accept the human cells show typical AS behaviors, making them a model that can be further tested for behavior changes upon therapeutic treatments. 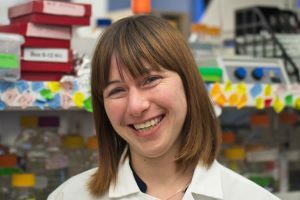 Dr. Alberini is another new FAST family member, and her work focused on the therapeutic potential for modifying IGF2 (insulin like growth factor 2) levels in neurodevelopmental diseases. When AS model mice were injected with IGF2 they showed significant improvement in memory and learning. The IGF2 could be delivered with just a simple injection under the skin, much like an insulin pump in diabetic patients. There is significant promise for both of these strategies to be translated to humans. This coming year should offer exciting updates on these newest strategies that FAST is funding. This concludes the first part of our 2018 FAST Scientific Summit blog, stay tuned for part two, which will focus on the progress being made on current clinical trials, and treatments soon to enter clinical trials.